How’s your garden doing? We’re well into the beginning of September and all that is left behind in my garden are peppers, and herbs that are still thriving. I hope that you enjoyed fresh herbs in your summer cooking as much as I have, and I always hate that come next month I won’t be able to go outside and pick a few sprigs whenever I want to use them say in this salad or pie. 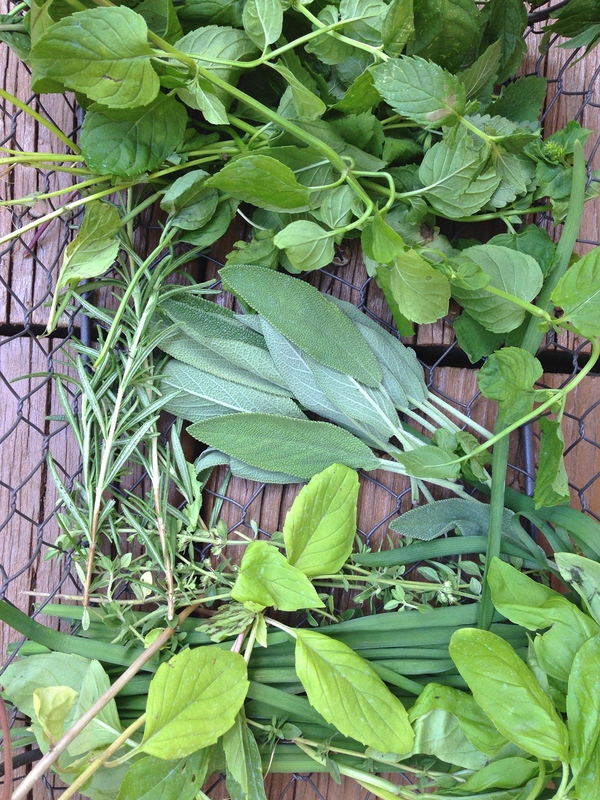 There are many ways to make you garden herbs last all year-long. You can freeze them in olive oil or water in ice cube trays, or you can dry them and make yourself some gourmet dried herbs that will save you lots of money the rest of the year, especially during the holidays. 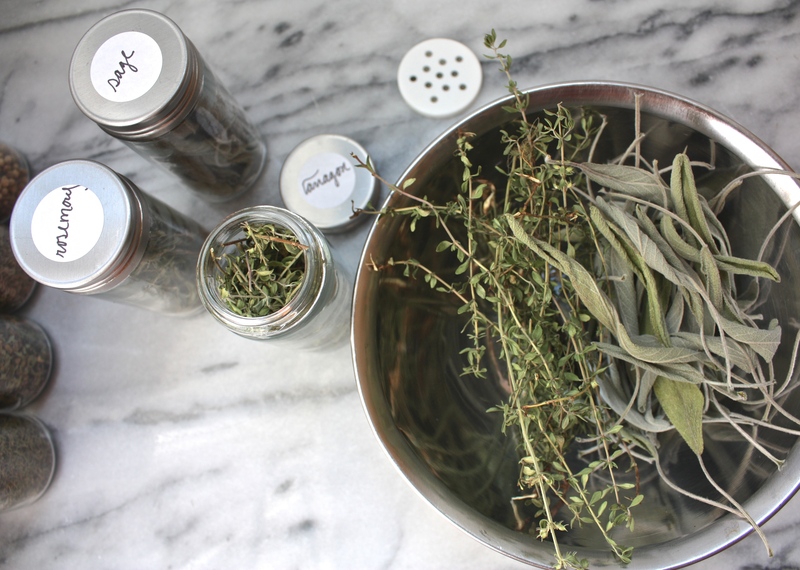 I’ve been drying my own herbs for two years now, and love that I can use sage and rosemary just about anytime I want, without having to spend so much to buy it. 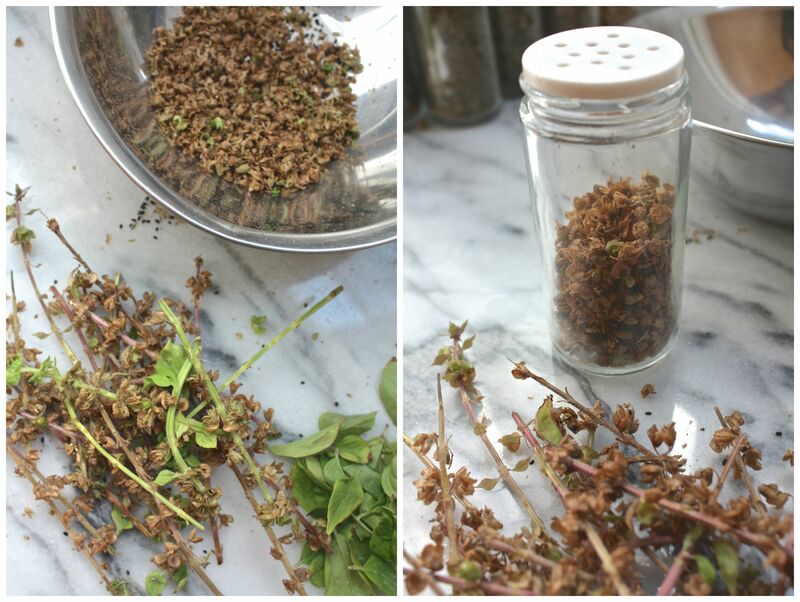 Drying herbs is actually much simpler than most think, and is a pretty low maintenance way of tending to your garden. I’m not a professional gardener, but have found these very easy steps successful in creating wonderful delicious culinary spices. 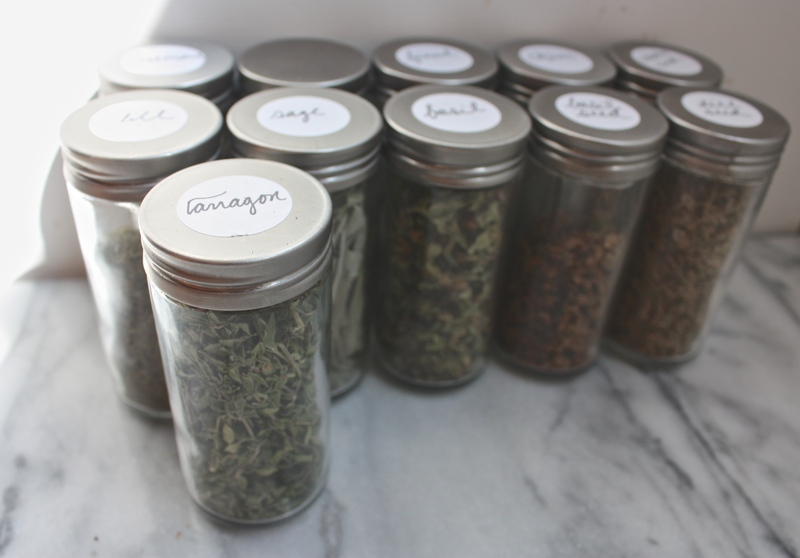 Scroll down to learn how you can easily make your own gourmet dried herb and teas. 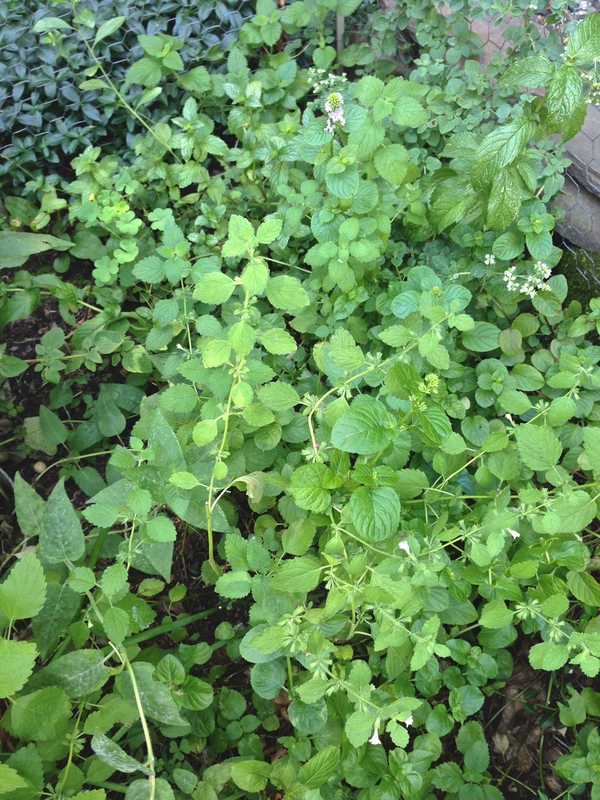 My corner herb garden includes honey balm, mint as well as orange and lemon mint versions too. I call this my tea patch, I like them fresh in my smoothies and mojitos, but come this time of the year I begin drying them for their digestion friendly and energy boosting remedies. 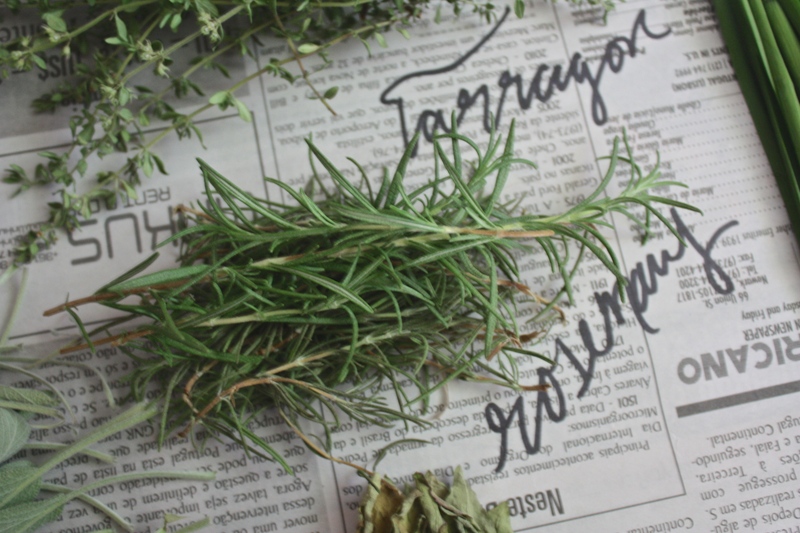 Collect your herbs, cutting the leaves or entire stem with leaves, like rosemary. , In a cool, dark and dry place, lay out newspaper sheets onto a flat surface. Choose an area in your home where there isn’t too much traffic, so that no one is knocking the herbs onto the ground during the drying process. Make sure whatever room you choose to dry your herbs, doesn’t become muggy and gain moisture during any time dry my herbs in my basement as it’s the ideal place for them. 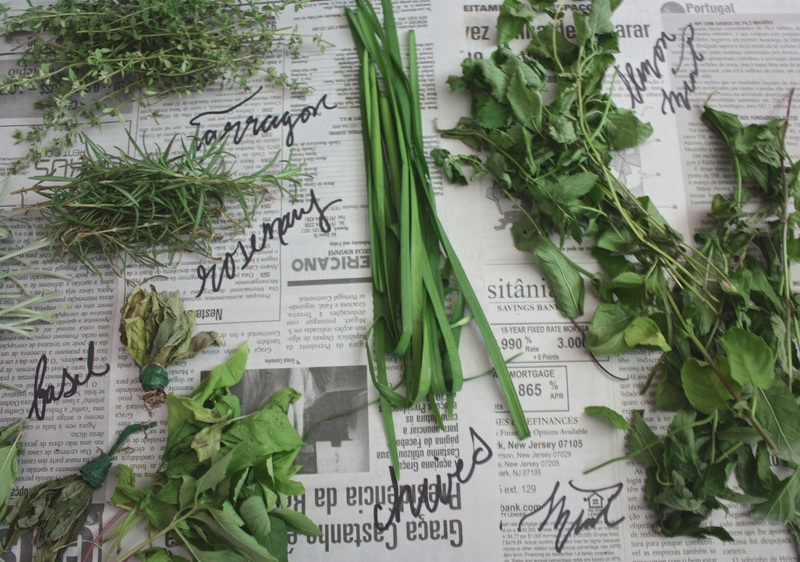 Arrange your herbs onto the newspaper sheets, labeling each. It’s best if you don’t pile the fresh herbs onto each other too much, as it will take longer to dry. Instead make sure they’re evenly laid onto the paper. 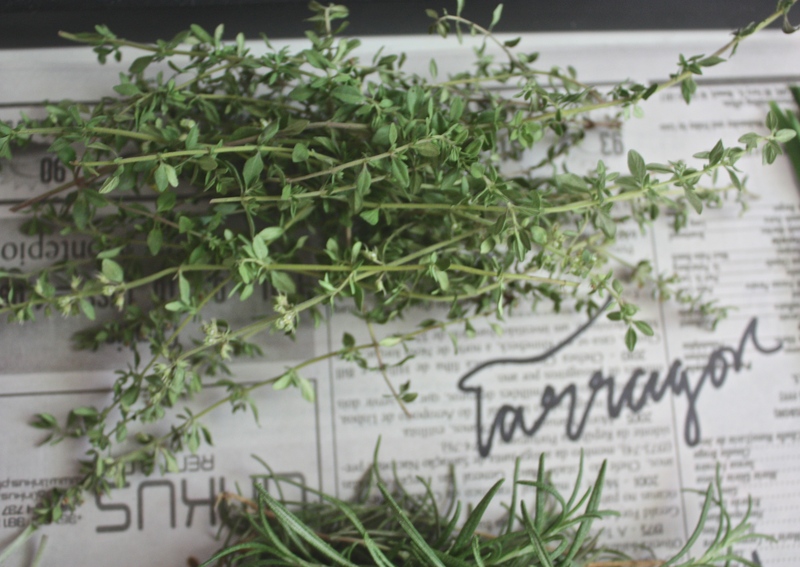 Cover herbs with newspaper, and allow to dry. Some herbs will take longer to dry than others. 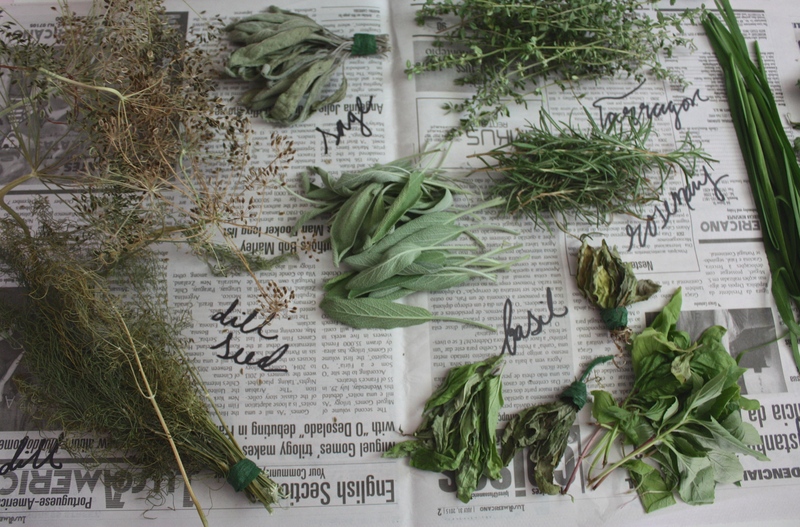 After a week check your herbs to see which are hard and can easily crumble within your hands. Rosemary, sage, mint and tarragon dry quiet quickly, while basil, dill and chives take longer to dry because they naturally have more moisture. 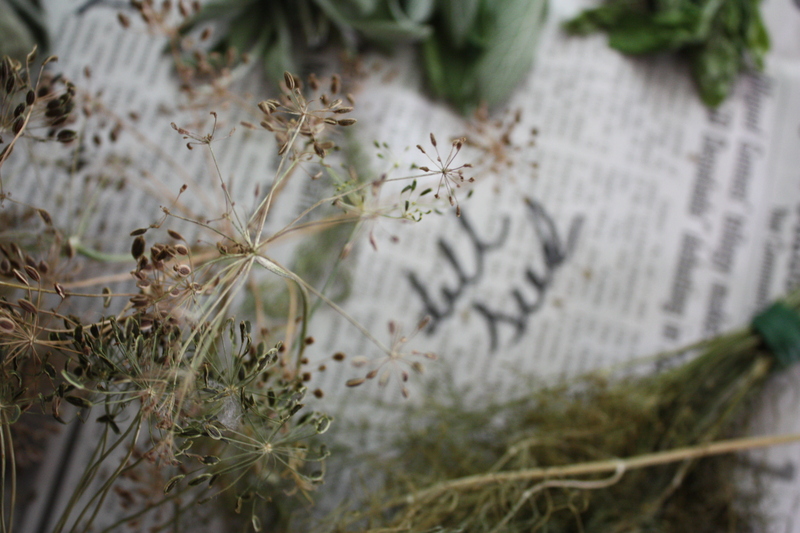 When the herbs are fully dried, you’re ready to jar them. I bought these spice jars from One Kings Lane, but you can be them wherever you’d like, just make sure they also come with the fitted top with holes. 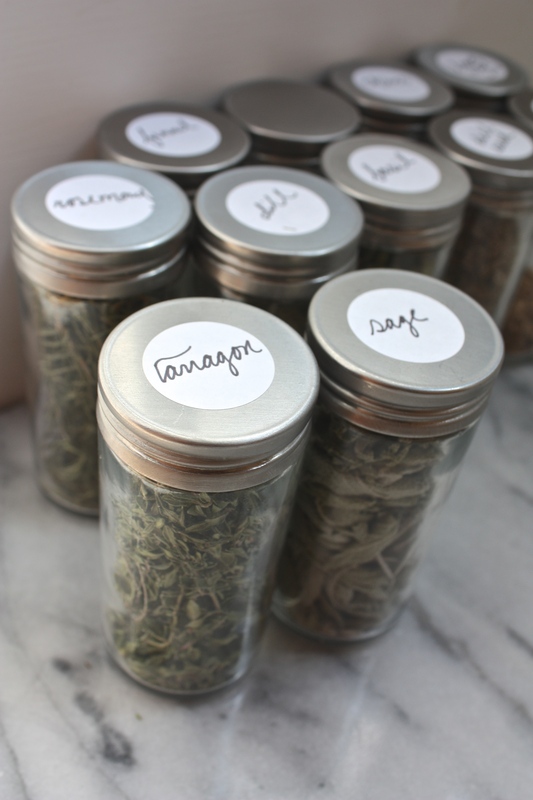 Certain herbs should be left as is, and simply placed into the jar with the stem; sage, rosemary, and tarragon. 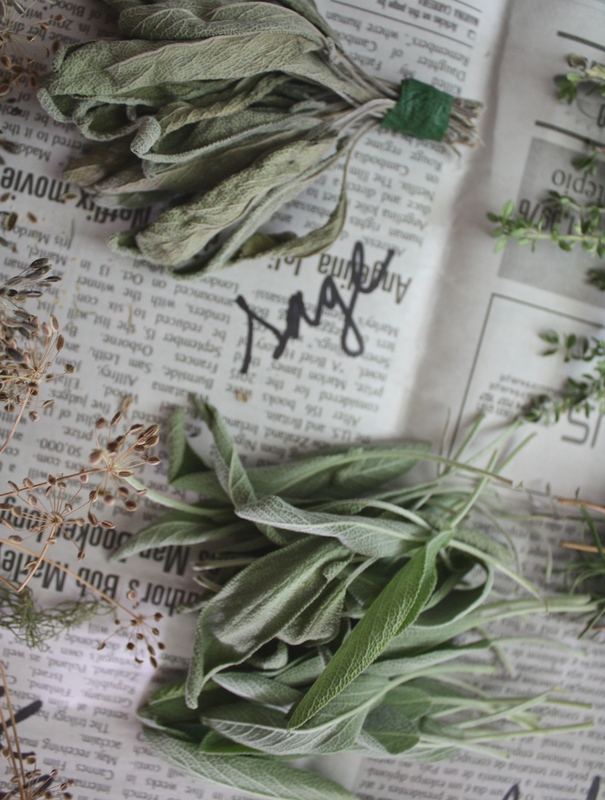 When ready to cook, crumble the sage right before using, and strip the tarragon and rosemary leaves right into your recipe. For herbs like basil, dill, mint and most other herbs, you’ll want to slightly crumble them a bit into a small bowl, stems and all, then jar. I think the best part is the amazing smell the herbs leave your hands after crumbling them, especially sweet fragrant basil. Label your jars accordingly. 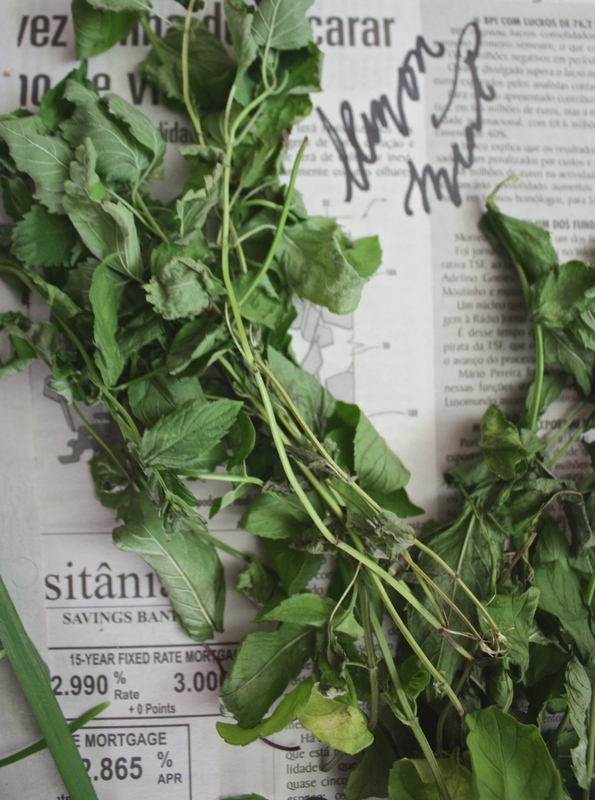 Dried herbs are best eaten within that year, although they don’t expire per se, they do begin to lose their flavor. So throw any old dried herbs you may have around the house, plus you’ll need to make room for all the new jarred herbs you’ll be making yourself. Herbs used for teas, like mints and honey balm, I place in larger jars since I usually have more of an abundance of them and I’ll use them in larger quantities. I don’t let any part of my herbs go to waste. 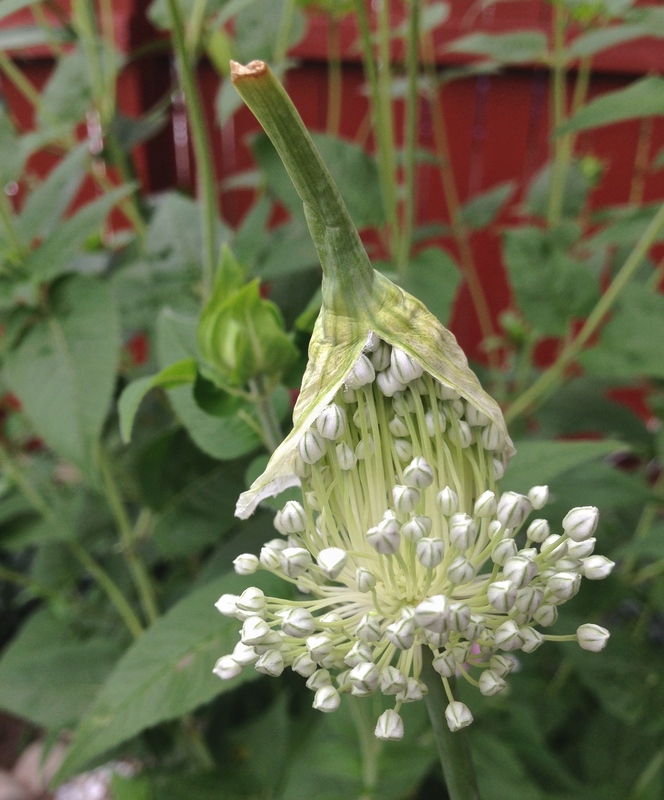 When your herbs start to flower at the tips, that’s what will then become seeds. 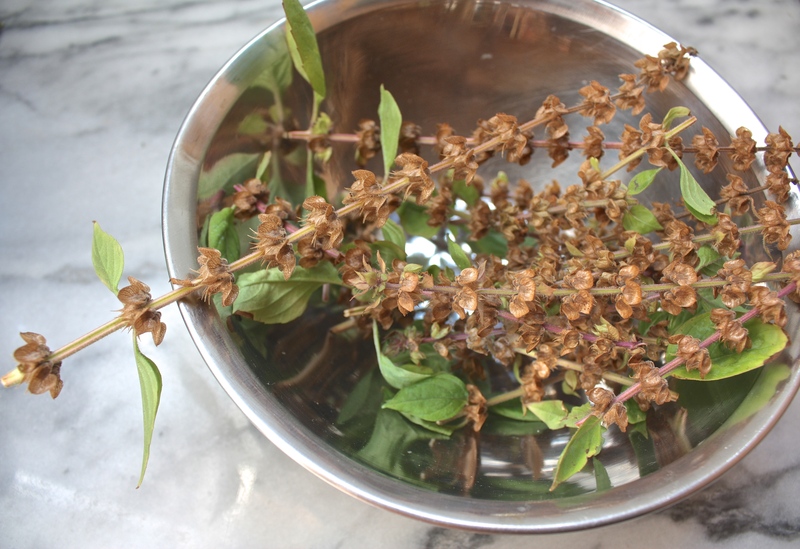 In order for your herbs to last longer during the season, you want to cut the flowers once they bloom but since I like to save the seeds from mine to replant next year, and even use in recipes, I allow the flower to dry completely. The seeds will then turn black once they are fully dry. 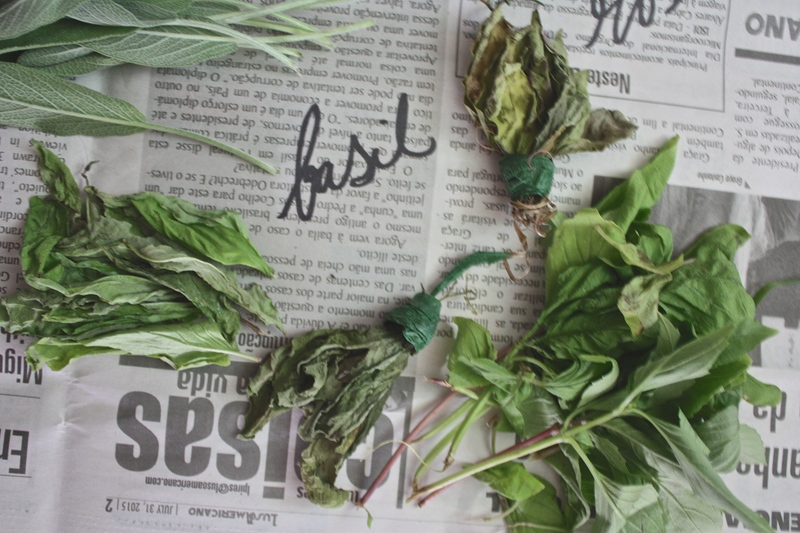 You can choose to snip the flower once its dried, then lay it onto newspaper in order for the seeds to fully dry but I find it easier to just allow the seeds to dry while still on the planted herb. 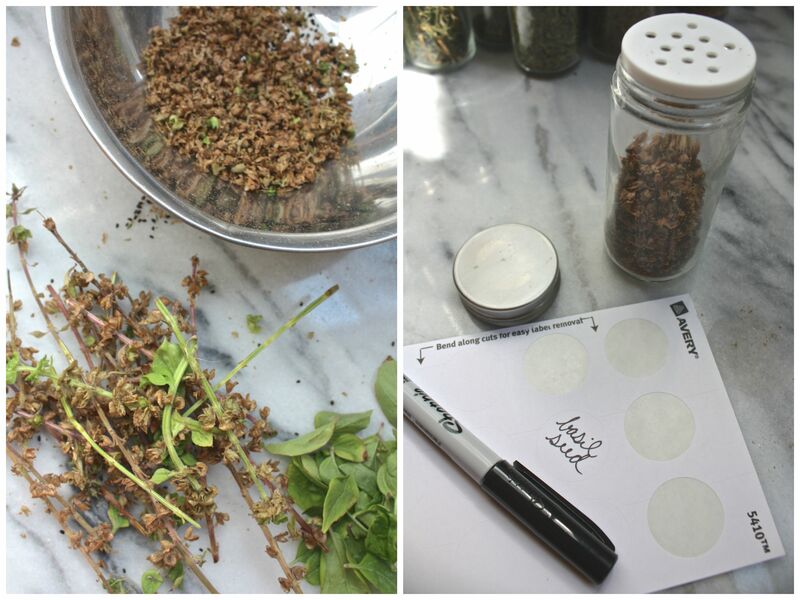 For chive, cilantro, dill or mint seeds, you can easily snip the top and crumble the seeds into a bowl. 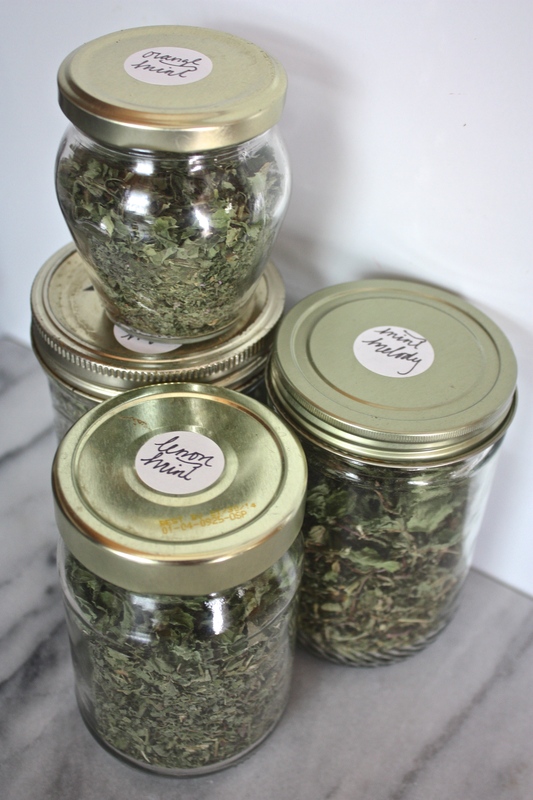 Shake off any stems and jar. 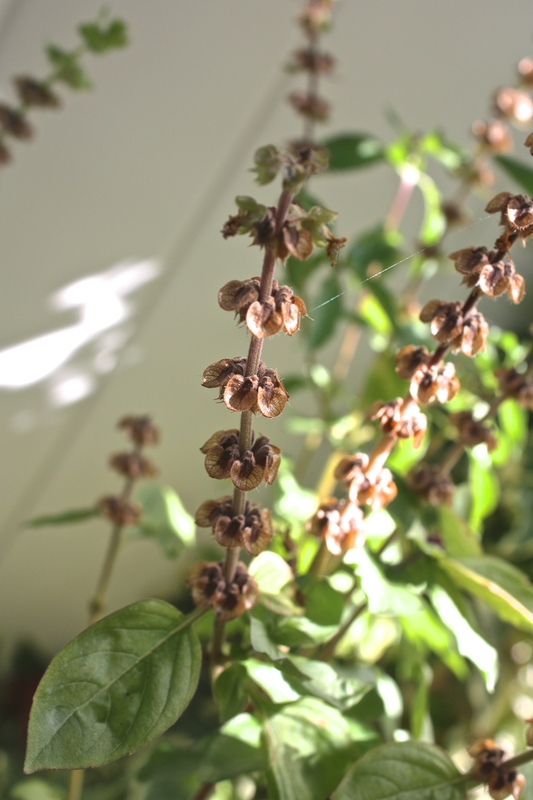 Since basil seeds are enclosed, I crumble them off the stem, removing the seeds from the shell as much as possible. Then place them into your jar. This is when you’ll the fitted top with holes will come in handy, as shaking the jar into a bowl will remove most of the dried outer leaf, leaving it inside the jar. It’s alright if your jarred basil seeds have the outer leaves, you’ll still be able to use them to plant. Label your jars accordingly. 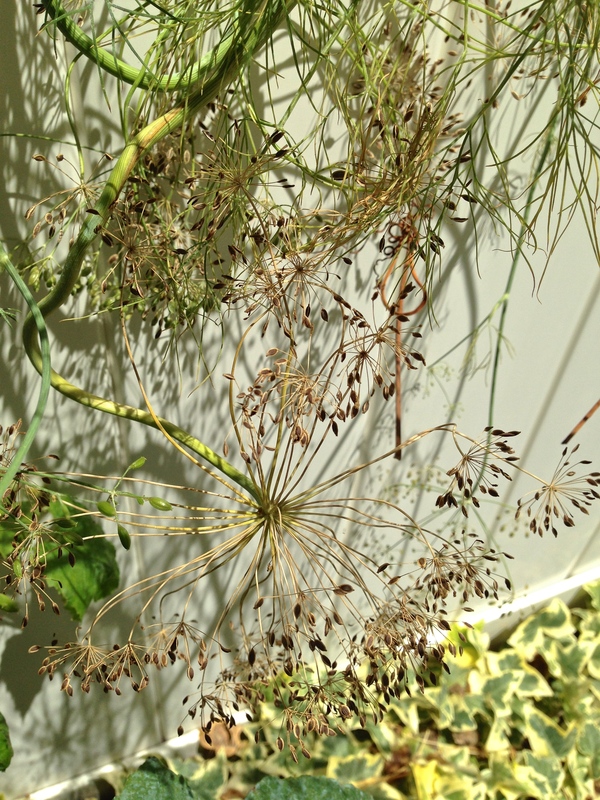 Like dried herbs, dried seeds from the garden are best when used within that 1st year, but seeds have a much longer shelf life. 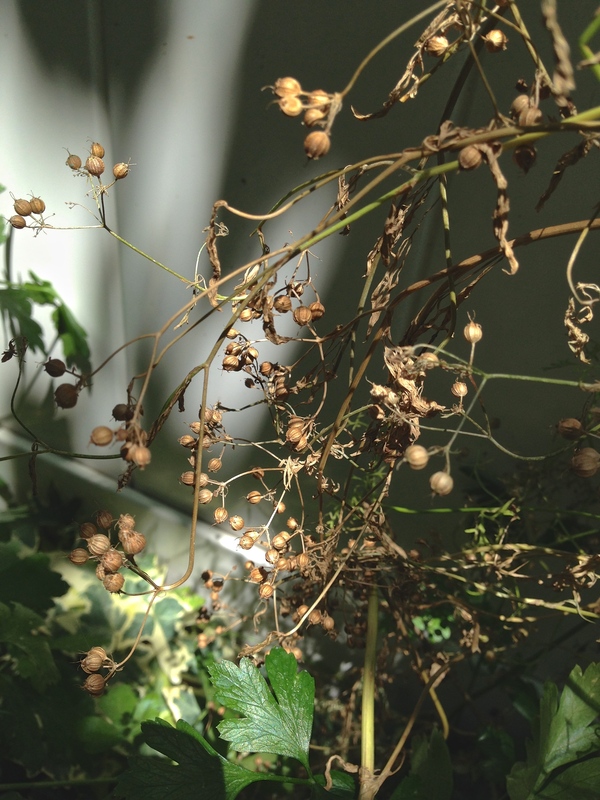 The dill and cilantro that grew this year in my garden were planted from seeds dried last year, and I even have replanted them for a second time this year. 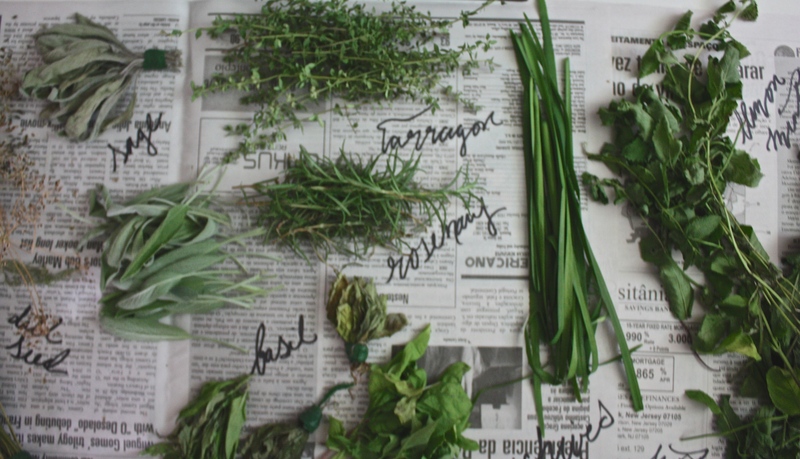 Aside from saving money on gourmet dried herbs or seeds, drying your own garden herbs allows you to feel a bit more connected to nature, and I’m sure your food will taste even better knowing that you worked to grow those herbs, and then to help prolong their flavor and goodness. 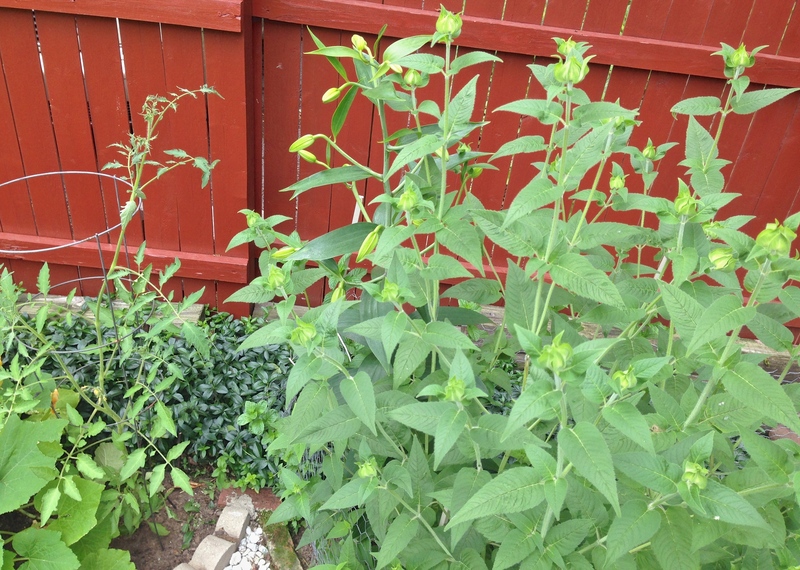 Hope this inspires you to take a small step to sustainable living and gardening!